Description: This is a double-deck ferry boat with a fold-down ramp at the rear to load and unload the accessory cars, and with movable barricades to keep the cars from rolling. 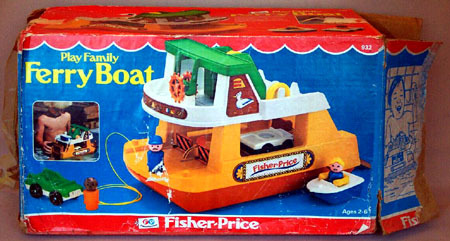 The Ferry Boat floats on water, or can be used as a pull toy with its yellow plastic pull string. This set was only made for a 6 month production run due to consumer complaints about the colors running off of the lithos when they got wet. FB932 - Ferry Boat - Large yellow double-deck ferry boat with a brown base, a white upper captain's deck, and a green roof over the captain's quarters. 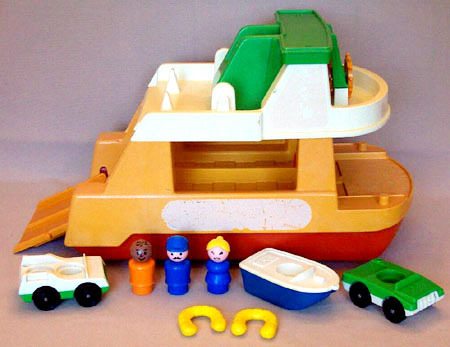 There is an orangish-tan double steering wheel and a yellow push-down whistle on the captain's deck. The back of the boat has a fold-down ramp to load and unload the #932 accessory cars. The lower deck has 4 red movable (fold-up or fold-down) barricades to prevent the cars from rolling. 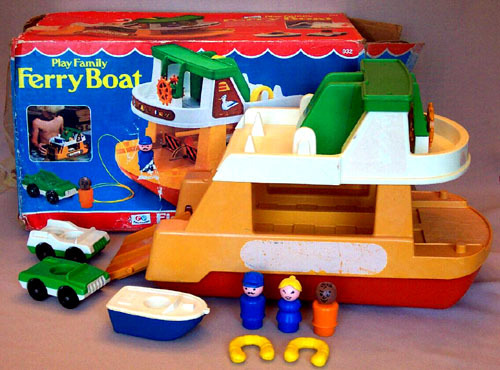 The Ferry Boat has barely visable wheels on the bottom, and a yellow pull-string attached to the front to use the Ferry Boat as a pull-toy. FPT1205 - Short red plastic ramp with a small "lane divider" ridge down the center creating two lanes for vehicles to drive on. The ramp has two pegs on one end to allow attachment to #932 Ferry Boat (pegs drop into open u-shaped slots in boat base). FPT564 - Blue top, white base 1-seat life boat. *See Variations below. FPT620 - Green top, white base 2-seat car (front-to-back seats) with slightly raised "fins" on both sides of the back seat. The car has a gas hole on the back corner, and is marked "fp" and "Fisher-Price Toys®" on the hood and on the bottom of the car. . The car rolls on 4 black smooth rolling wheels with metal axles. The wheels are marked "Fisher-Price Toys". *See "Variations" below. ARPP - Tall blue captain with a black moustache and a blue engineer type hat. CSPP - Orange Afro-American man with black heat-stamped hair. This figure is NOT Gordon from Sesame Street, as Gordon has a moustache and goatee. FNPP - Blue mom with a blonde ponytail and fancy eyes. FPT22262 - White top, blue base 1-seat life boat. FPT618 - White top, green base 2-seat car (front-to-back seats) with slightly raised "fins" on both sides of the back seat. The car has a gas hole on the back corner, and is marked "Fisher-Price Toys" on the hood and on the bottom of the car. The car rolls on 4 black smooth rolling wheels with metal axles. The wheels are marked "Fisher-Price Toys". FPT619 - White top, green base 2-seat car (front-to-back seats) with slightly raised "fins" on both sides of the back seat. The car has a gas hole on the back corner, and is marked "Fisher-Price Toys" on the hood and on the bottom of the car. The car rolls on 4 black smooth rolling wheels with metal axles. The wheels are NOT marked. FP932BOX1979 (Box ONLY) - Sold in a 7-5/8" wide, 13-5/8" long, 8-7/8" high box. FP932SET1979 - Complete set in original box. WFL: 07-AG-01-5-A.